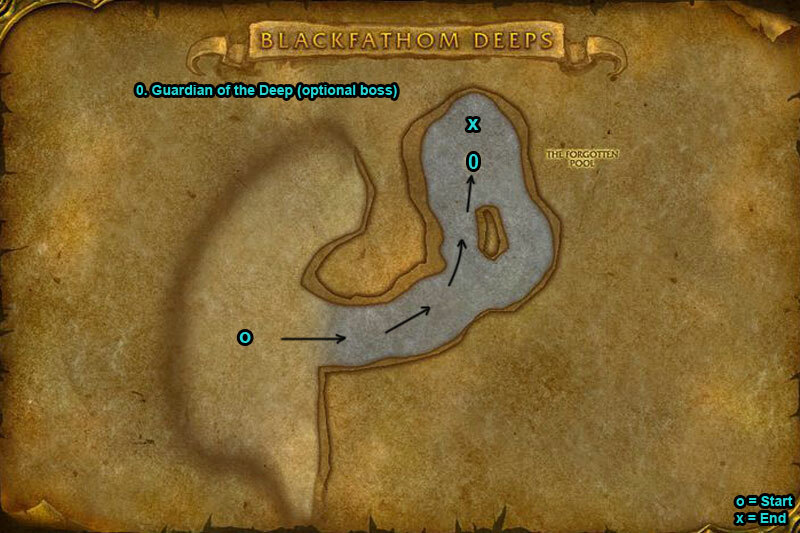 You can find the Blackfathom Deeps dungeon within Ashenvale, Kalimdor. 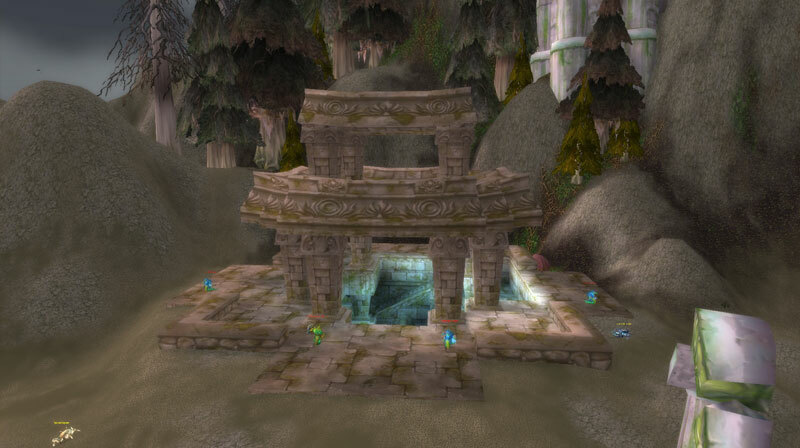 Go inside and dive under the water, swim under the wall to enter the cave. At start jump over broken platforms. If a player drops the Coiled Rope rest of you can swim over to that. Underwater boss Guardian of the Deep can be reached faster by swimming to a pile of ‘Guardian Eggs’. Click one & you’ll gain increased swim speed by 75%. 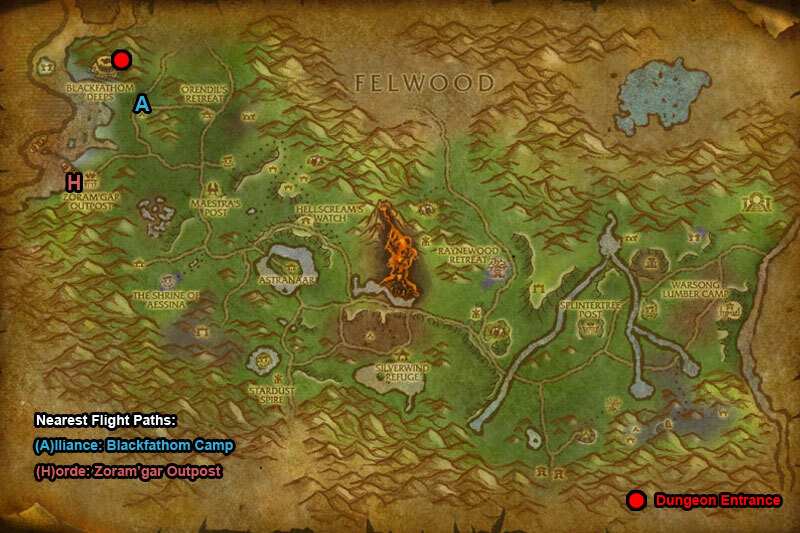 /i Move out way of lightning pool on ground, spins around then charges forward. Hits random targets with static during fight. 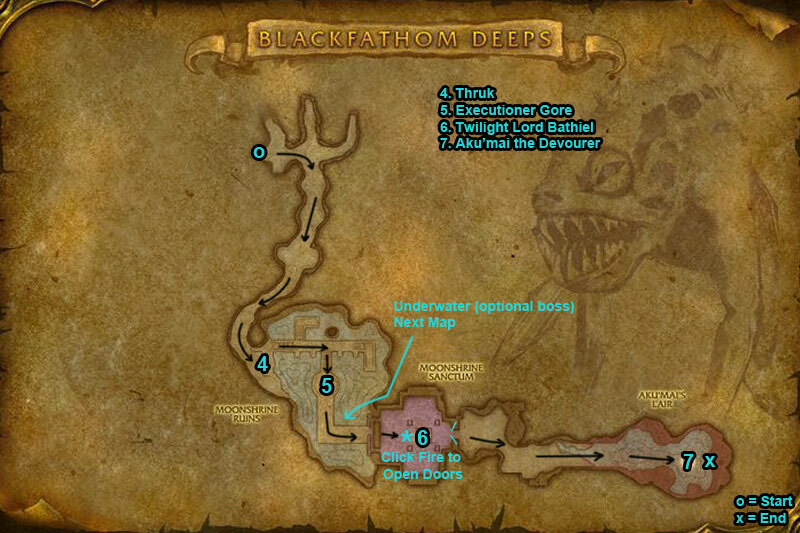 /i Avoid standing in Maw of Death (purple line on floor). Run away from Foul Tempest (hit with green bolts). /i Grabs a player with Leviathan’s Grip. Summons tentacles to hit ground (move out of the crumbling floor). /i Pulls in & roots a player in a fishing net. Casts Fillet of Flesh smashing the ground around him, move away. /i Strikes the floor, move out of purple line. Avoid standing in the purple circles left on ground. Devouring Blackness grabs a player draining their health, interrupt this. /i Does aoe damage with Shattering Song (circle echoes out). Spore Cloud summons adds. Heals himself when eats a Blue Shale Crawler. /i Restorative Waters summons adds then boss absorbs them to heal, kill what you can. Run away from Piercing Rain, ice shards fall & follow enemies. /i Move around to avoid damage from falling rocks. 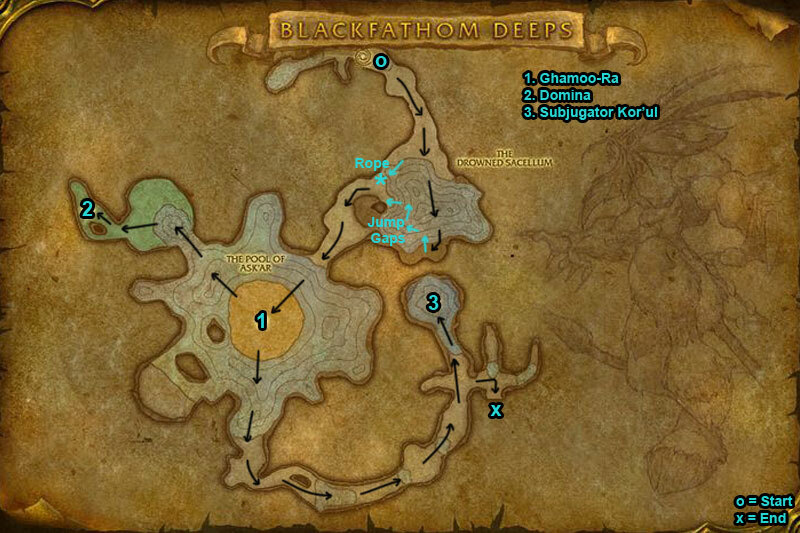 Tearing the Void summons tenticles to hit ground (move out of the crumbling floor). When soloing this dungeon, it appears that Lord Bathiel is an impossible kill. His restore happens too quickly for one person to handle even when in the 40’s on level. Any suggestions on how to handle him when soloing, would be great. Or does one just have to reach a level that he can be one-shot killed? That’s a bit disappointing, but if that’s the only solution…. Don’t worry your not the only one this boss is difficult to solo even at level 40. Seems good way to try is kite him between healing, then damage him during healing and kill adds really fast. Bloodlusts, dps potions anything for a boost will help otherwise its just higher level or in a group. I managed to kill Lord Bathiel with a lvl 46 rogue but after he died a crapload of “Tormented Sacrifices” spawned and nearly got me (escaped by running back out of the temple thing). Haven’t tried to go past them yet because I’m trying to figure out where they came from.